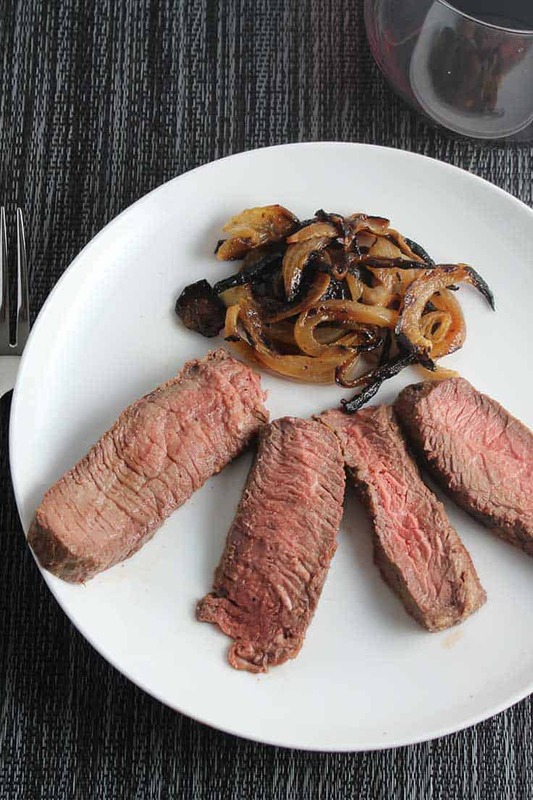 Grilled steak and onions is an easy recipe to make on the grill. 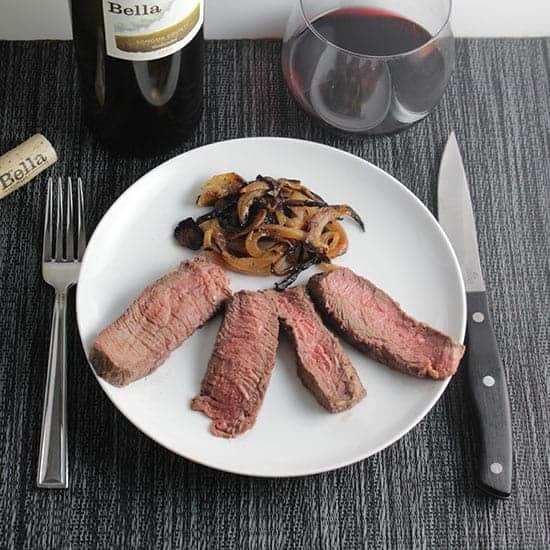 The steak starts with a simple yet flavorful rub, and we serve it with a bold red wine. The weather has been pretty dreary this spring in New England. Now we finally have a sunny weekend with temperatures predicted to get into the low 90s. Definitely a great time to talk about grilling and wine to go with that grilled food! Thanks to Camilla at Culinary Adventures with Camilla for hosting Wine Pairing Weekend today, talking about wine for grilled food. 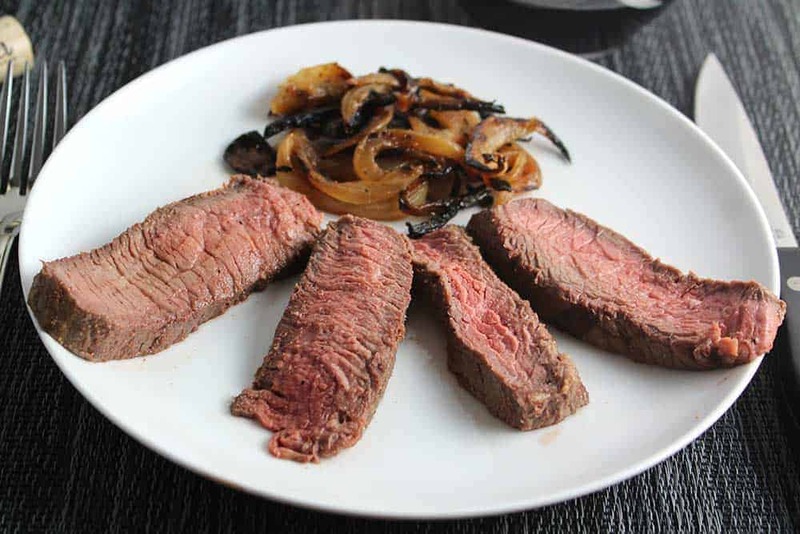 This grilled steak and onions recipe is quite easy. I tend to keep it simple the first few times I get the grill going in the season. By midsummer I’ll be mixing it up with some more challenging preparations! We get started by making a simple rub for the steak, and letting the meat absorb its flavors for a bit as we prep to grill the onions. I have a grill pan that is great for doing the grilled onions. If you don’t have a grilling pan, this Easy Grilled Fajita Burger recipe at Two Healthy Kitchens gives instructions on how to grill the onions without a pan. Of course, if you don’t have a grill pan, you might want to pick one up! Here’s an Amazon link to a Weber grill pan that looks similar to what I use. (if you choose to use my Amazon affiliate link, I earn a small commission from the sale at no additional cost to you). 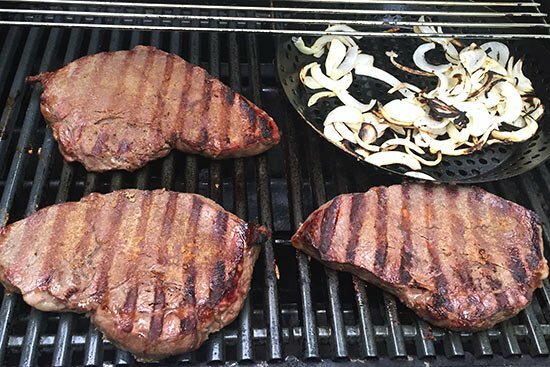 Our steaks took about 14 minutes to come out medium rare, but you really need to get a feel for timing on your grill. Also pay attention to the thickness of the steak. Ours were well over an inch thick; a thinner steak will cook faster. Note that sirloin steaks tend to cook quickly, and you don’t want to overcook them. You could easily substitute another cut here–ribeye and NY strip steak are two of my favorites. The steak certainly calls for a bold red wine. The spice rub and onions made me think of a Zinfandel, which I go for often with grilled steak. I picked up the 2013 Bella Zinfandel ($23, 14.9% ABV) off the shelf at Pairings Wine & Food as a zin they carry that I had yet to try. The Bella Zin is from Sonoma County, one of my favorite regions. I got lavender on the nose of the Bella Zinfandel. Taste of strawberry and blackberry fruit, along with a bit of white pepper and cardamom. Those spice notes seemed to hold out good potential for the pairing. But that high alcohol content really was evident when having this zin along with the steak, giving a sense of heat in the glass that prevented it from playing the desired complimentary role. I would say this zin is better on enjoyed on its own, and consider other pairing options. 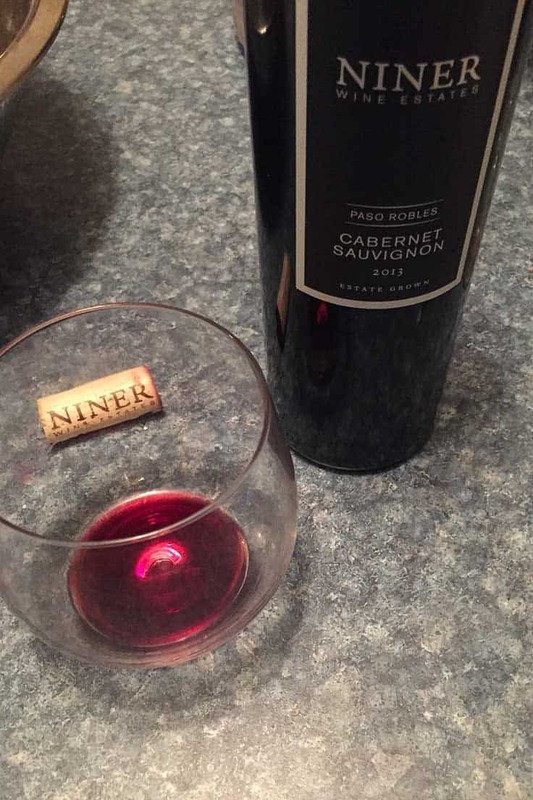 One good alternative could be the 2013 Niner Cabernet Sauvignon ($34 , 14.3% ABV) from Paso Robles. This cab has 5% Petit Verdot blended with the cab. I enjoyed this cab earlier this spring with another steak dish, and could see it working well with the grilled steak and onions. The Niner Cab has a big violet nose. Lush cherry fruit and velvety mouthfeel. Just a bit lower in alcohol content than the zin, I don’t recall it overwhelming the food like the Bella. I would give the Niner a try with our grilled steak and onions, or experiment with your own pairings and let me know how it goes! Grilled steak with a flavorful rub, served with grilled onions. Make the rub: combine the garlic, cumin, salt and sugar in a bowl. Place the steaks on a work surface. Sprinkle spice mix on one side of the steaks to cover, then rub into the meat. Turn the steaks over and repeat. You may have a bit of leftover rub. Let the steaks sit with the rub for about 15 minutes as the grill heats and the onions get started. Preheat a grill to medium high, using just the front burner(s) of the grill if using gas. Toss the chopped onion with olive oil. Place the onion in a grill pan. Before placing on the grill, shake the onions a bit to allow excess oil to drip through. Then place the pan with onions on the grill so that the pan is just partially exposed to the direct heat. Cover the grill. The onions will take about 15 to 20 minutes to cook. Stir them every 5 minutes or so. After the onions have been on the grill for 5 minutes, add the steaks to the grill over direct heat. Cover the grill, and grill the steaks for 6 to 7 minutes. Turn the steaks over, grill for another 6 to 7 minutes. Check for doneness. 14 minutes total grilling time gave us nice medium rare steaks, but cooking time will vary based on your grill and the thickness of the steaks. When the steaks are done to your liking, remove and let rest on a platter for a few minutes. When the onions are well browned, carefully remove the grill pan and transfer the onions to a serving bowl. Slice the steak into 1/2 inch thick strips. Plate with onions served alongside the steak. Enjoy with a green salad and bold red wine. and Camilla – at Culinary Adventures with Camilla – plated her Grilled Octopus and Potato Salad with a Pet Nat from Donkey & Goat. You can chat with the #winePW crew about grilled food and wine pairings during our live Twitter chat on Saturday, June 10, 2017. Simply tune into the #winePW hashtag on Twitter at 11 am ET / 8 am PT to join the conversation. Check out upcoming and past #winePW topics here. That looks wonderful. Thanks for the pairing tips. Thanks, as always for the pairing tips, David. I have never tried that Niner Cab, but I can definitely see it working with grilled steak. So, when I track down a bottle, I know what I’m having. Thanks, too, for starting this group. I learn something every month! Thanks for the feedback, and hosting once again! Looks delicious. I love the flavor of grilled onions. Then there’s steak and Cab — is a winning combo!. 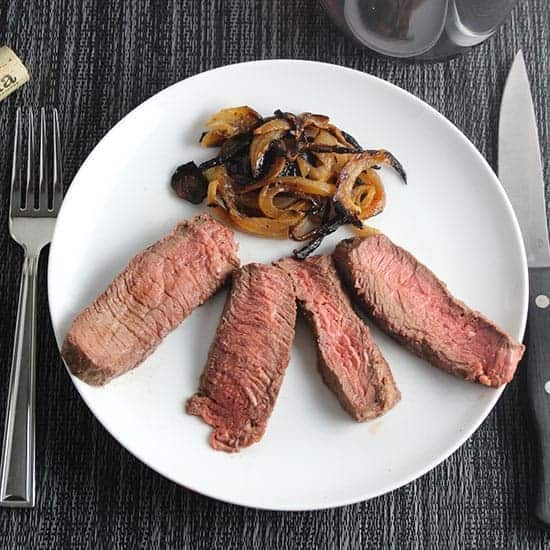 I had to force myself not to do steak again David, but it is such a perfect thing….a juicy grilled steak with a hearty red wine. I needed to do something easy to get this post ready during a busy stretch! Simple works for me! I think a rub can really change the pairing equation, appreciate your honesty! Simple is usually best. Steak and onions is such a classic. I really like a cab with a touch of Petit Verdot so I would probably prefer that pairing as well. I’ve noticed a larger variety of onions in the store, plus we have some in the garden… I’d love to serve this, classic and delicious!